IBM® DB2® 9 and 10 for z/OS® have added functions in the areas of security, regulatory compliance, and audit capability that provide solutions for the most compelling requirements. DB2 10 enhances the DB2 9 role-based security with additional administrative and other finer-grained authorities and privileges. This authority granularity helps separate administration and data access that provide only the minimum appropriate authority. The authority profiles provide better separation of duties while limiting or eliminating blanket authority over all aspects of a table and its data. In addition, DB2 10 provides a set of criteria for auditing for the possible abuse and overlapping of authorities within a system. In DB2 10, improvements to security and regulatory compliance focus on data retention and protecting sensitive data from privileged users and administrators. Improvements also help to separate security administration from database administration. DB2 10 also lets administrators enable security on a particular column or particular row in the database complementing the privilege model. 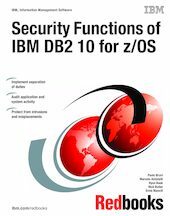 This IBM Redbooks® publication provides a detailed description of DB2 10 security functions from the implementation and usage point of view. It is intended to be used by database, audit, and security administrators.